Welcome to A Wandaful Thing and my first Vintage Party of 2018. Thanks to all who have linked up in the past. Hey, if you’re new here, welcome! I appreciate each and every one of you who continue to come back and hang out with me. I am so impressed by all your creativity and talent that I want to share it with the world. 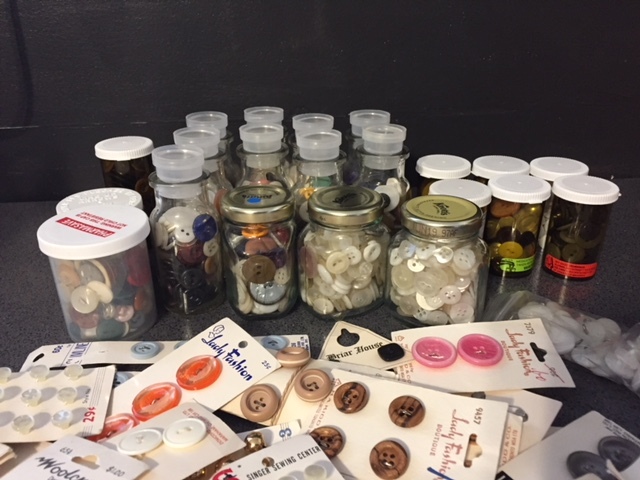 I’m always interested to see what vintage goodies, finds and projects you all have to share but today I want to see what you have created with your vintage buttons. I will be giving away to one lucky follower one of the things I create with my vintage buttons. 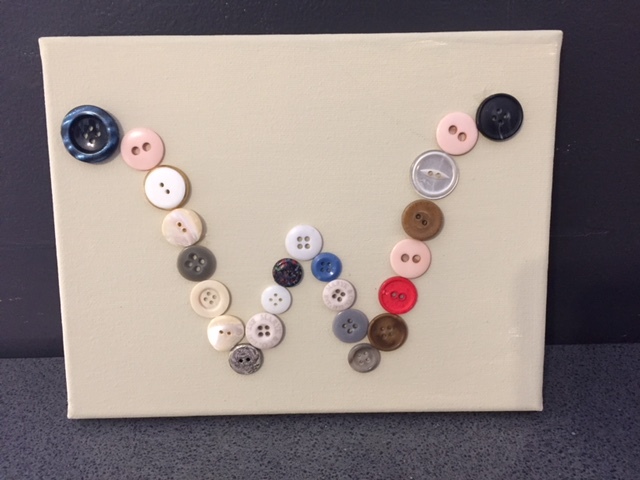 Check at the end of this post to find out how you could win my vintage button creation. I decided to use my Cricut and my Cuttlebug to help with my first creation. I got all these buttons at an auction last year so I had fun picking through them to find the ones I wanted to use. For my first creation and the one I will be giving away, I decided to make gift tags. I embossed some plain card-stock with my Cricut Cuttlebug and then using just my Cricut, I cut out some tags (two sizes). I selected some buttons and glued them on the front and then attached some cotton string to the back. I like the way they turned out. My second creation is for my cubicle makeover at work (I will post about this at another time). Just a little something to make it mine. Small canvas with the initial of my first name. I may add some further embellishment or more buttons, I haven’t decided yet. Here is a craft my friend and fellow blogger made – she blogs over at Youcanalwaysstartnow. 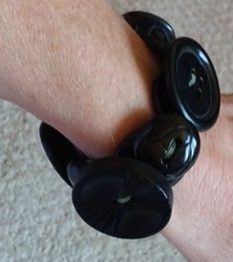 A button bracelet – I LOVE this!! 1. Content: Submit up to three posts that involve your vintage button crafts, DIYs etc. No shops or direct advertising, please. 7. Giveaway: Keep in mind that from time to time I will be giving away what I make from my vintage challenge – see end of post for details on how to win! For the chance to win my vintage button creation you just need to follow me on any two of my social media accounts; for example subscribe to this blog and follow me on FaceBook, or subscribe to this blog and follow me on Pinterest or Instagram or any combination you want. Wherever you follow be sure to leave me a comment so I know to include you in the giveaway draw. This entry was posted in challenge, Decorate, DIY, Make, vintage and tagged artist canvas, buttons, challenge, cotton string, craft, creativity, DIY, gift tag, giveaway, initial, monthly, repurpose, repurposed, thrifted, vintage. Bookmark the permalink. Just nominated you for Brotherhood of the world award. The canvass is sweet and love the tags. WOW to all the buttons you scored. See lots of projects happening there! !